Most of the articles on this blog look at the tank from a British perspective. In the end, though, it would be the effect they had on the Germans that would decide how useful a weapon they really were. 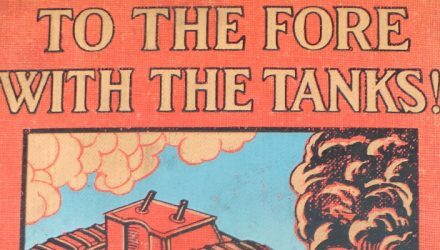 This post looks at some of the early German responses to the tank. 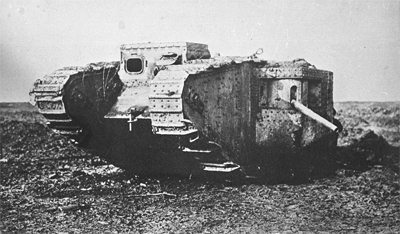 The tank’s first use in combat was on the 15th September 1916 at Flers. After a few small actions their next large scale use was at Arras on the 9th April 1917. During this time the Germans were unable to capture a tank, so all they knew about them came from vague intelligence reports and generally inaccurate sketches. 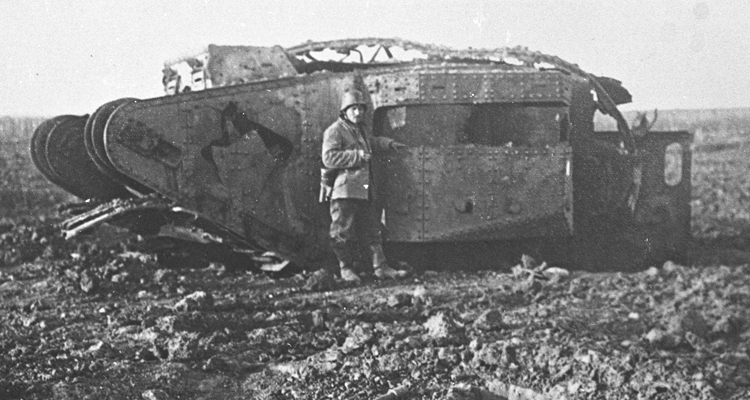 Tank 799 shortly after capture. This isn’t to say they ignored the threat tanks posed. Although German commanders didn’t have a good idea of what tanks looked like, they did have several good ideas about how to defeat them. The first tank attacks had caused fear amongst German soldiers. Some had fled rather than face them. Even at Flers, though, the Germans had been able to destroy tanks with artillery, and they found that machine gun fire and grenades could damage them. After Flers the Germans formed 50 anti-tank artillery batteries. Each had six 7.7cm field guns fitted with smaller wheels to make them easier to dig in and hide. They also issued more steel-cored armour piercing SmK bullets in 7.92mm calibre for their machine guns. The trenches in the new Hindenburg Line defences were widened to make them harder to cross, and design work on a German tank was begun. 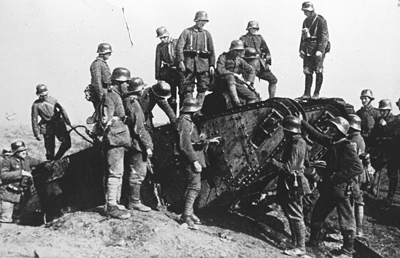 The first chance the Germans had to examine a tank was during the Battle of Arras. A number were disabled and abandoned behind German lines. 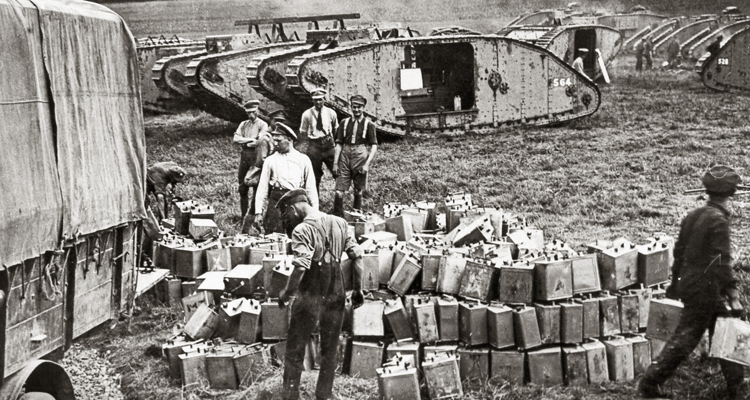 Perhaps the most valuable was Tank Number 799, a Mark II. This was knocked out at Bullecourt on the 11th out of sight of the British front line, meaning the Germans could reach it in safety. German soldiers inspect an unidentified Mark II. Aside from becoming something of a tourist attraction for German soldiers, Tank 799 was measured, inspected, photographed and had parts removed for analysis and firing trials. These showed that 7.92mm SmK ammunition was extremely effective and could be relied on to penetrate a tank’s armour. The results of this analysis, combined with their experience so far, convinced the Germans that the tank was slow, had poor mobility and was highly vulnerable. The underwhelming debut of French tanks on the 16th April just reinforced this belief. Work on the German tank was scaled back and several anti-tank batteries were disbanded. Unfortunately for the Germans, they never learned that 799 was completely unarmoured. Their belief that the SmK bullet was adequate was soon disproved by the appearance of the improved Mark IV (although its mobility and protection against 7.7cm shells was no better). By mid-1917 their fear had faded and the Germans were confident that their anti-tank tactics could deal with a weapon they saw as a limited threat. This assessment was not to change until the 20th November, at Cambrai. Find out more about how unarmoured Mark II tanks ended up going to war here.